At Christmas, we had to switch the television subtitles on for my mother-in-law to be able to "hear" the news effectively. On one of our TV sets, we haven't been able to work out how to switch them off again. This was originally a bit of an annoyance but, recently, I've been paying more attention to what's in the subtitles and it's been really interesting. The thing I wanted to write about here is a phenomenon called GOOSE-fronting, and what prompted it was a subtitler typing the word may instead of now on the BBC Breakfast programme this morning. The presenter, Charlie Stayt - who is on the young side among the presenting team - pronounced the word now as something close to [naɨ] and this was all a bit too confusing for the poor subtitler. By the way, I've seen all sorts of other fun incorrect subtitling, including liars for lawyers, which made me laugh out loud - particularly as the lawyers were representing someone to whom the public clearly doesn't give much credibility (mentioning no names). To be fair, news and other live TV shows have to be subtitled very quickly indeed and in real time, so it's not really surprising lexical or grammatical errors get made in these situations. I did actually have an interview many, many moons ago for a BBC subtitling job and I know they are able to watch as well as listen, but sometimes the listening seems to take priority, the subtitler not paying attention to the visuals, and I do sometimes wonder about the general knowledge of some of the people doing it. 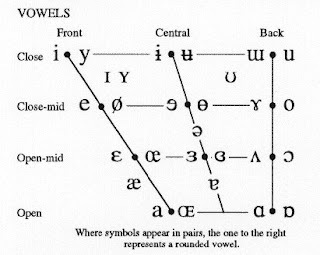 As John Wells points out in his phonetic blog post of 16th June 2010, "it was Caroline Henton who first properly documented the new fronting of RP GOOSE, in her 1983 article 'Changes in the vowels of Received Pronunciation', JPhon 11: 353-371". GOOSE-fronting is a process by which the close back rounded vowel /uː/ is produced with a much more front tongue gesture, so instead of old-fashioned RP /uː/, the speaker produced something more like the close central rounded vowel [ʉː]; this symbol is know as "barred u". You can see this symbol on the full IPA vowel chart reproduced here. This process is also affecting the FOOT vowel, /ʊ/, to some extent ... and this extends to the target for back-closing diphthongs /aʊ/ and /əʊ/. More recently, however, the lip-rounding associated with these vowels appears to be in decline among younger speaker groups. Wells mentions this at the end of his blog post, and Cheshire, Gillett, Kerswill and Williams comment on this in their report of 1999; see in particular the Annexes from p. 16 onwards. As an observation, the younger speakers of (near-)RP accents get, the more fronted and unrounded their GOOSE and FOOT vowels seem to be. There is very little difference for some speakers between GOOSE and geese, for example, and between mouse and mice. Natasha Kaplinsky, another erstwhile rather younger BBC Breakfast presenter, commented to one interviewee that it was [ˈnaɪs tə ˈsiː jɨ] ("Nice to see you"), for example. This is not something only observed in (near-)RP but also in other accents. It has been noted as a phenomenon in South African, Australian and New Zealand English, and we even note that it has been recorded in Hong Kong English, too (Setter, Wong & Chan 2010), which may be more interesting as, in learner terms, it has traditionally been based on a conservative RP accent. John Wells comments in his blog post that, nearly a century ago, Daniel Jones had spotted GOOSE-fronting in the environment of a preceding /j/ - so in, e.g., music or beauty, but not in spoon - and that it could be spreading from there. Wells does not attempt to explain the unrounding of the lips, however. I'm not too hung up on the "whys" of this, and just enjoy observing the differences and, sometimes, the confusion which results.